Dec. 31, 2017, Picture Butte, AB. For the second year in a row we received an Operational Staffing Grant from the Alberta Museum Association. The amount this year was $ 18,120 – which was the amount we had applied for. This funding is to provide for a large portion of the General Manager’s salary. This wonderful support will help us celebrate our 35th Anniversary year by allowing us to carry out all the events we have planned! 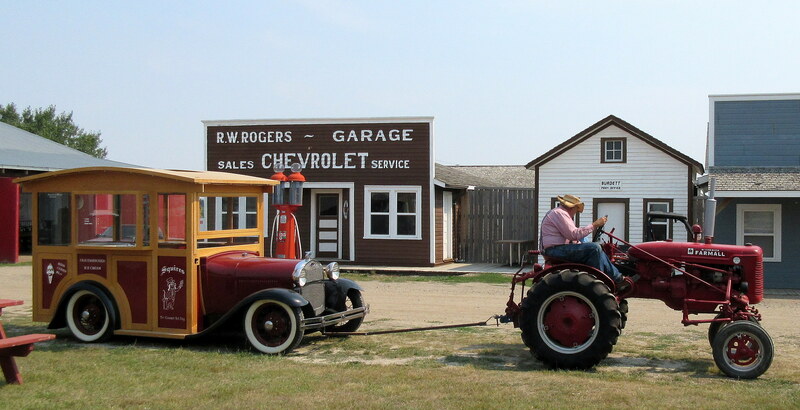 December 24, 2015, Picture Butte, AB – Through a generous grant, made available by the Government of Canada through the Alberta Museum Association, the Board of Directors are very pleased to announce Coyote Flats Pioneer Village is the recipient of $ 25,000 to be used towards the salary of our General Manager for the 2016 year. The position of General Manager is critical to the museum’s future, and builds on the momentum gained in 2016. We appreciate the support from our Federal Government and our Provincial Museum Association! September 18, 2015, Picture Butte, AB – An innovative approach to recording and celebrating history has been recognized an outstanding (English language) history project in Canada. The Coyote Flats Oral History Project was the winner of the 2015 Governor General’s History Award for Excellence in Community Programming. The project is a partnership of Coyote Flats Pioneer Village, Picture Butte High School (PBHS), and the Centre for Oral History and Tradition (COHT) at the University of Lethbridge, and aims to preserve history by video-recording interviews with seniors from Picture Butte and area. The videos produced have been of two types: short, story-focused videos produced by PBHS media students, and longer, life-history recordings filmed by project coordinators. Coyote Flats partnered with PBHS to inspire a new generation to be interested in history, and to create opportunities for ongoing mentorship between seniors and youth. Bringing the COHT into the partnership created further opportunities for the students to learn about the study of history, while providing tremendous support and guidance to the project from experts in the field. The COHT also trained project coordinators how to conduct life history interviews, and is archiving the entire collection of videos at the University of Lethbridge. While the project is ongoing, results to date include 5 outstanding student videos, 48 life history interview videos, and increased community awareness and support for the preservation of history. The award was presented by His Excellency the Right Honourable David Johnston, Governor General of Canada, at Rideau Hall on October 16, 2015. Picture Butte, AB – On Friday, September 18, 2015, one of our heritage buildings burned to the ground. The building was used as a storage building, and was not open to the public, nor did it house any permanent displays. Unfortunately, there were four horse-drawn carriages stored in the building, and the carriages as well as the building itself were a total loss. The Bohne Building was used as a storage building, and was of lower importance when compared to our other heritage buildings. The loss of any heritage building is devastating, and neither the building nor the carriages are likely replaceable. Due to the difficulty in obtaining insurance coverage for historical buildings and irreplaceable artefacts, the loss is not covered by insurance. The cause of the fire is not known, though it is seen as suspicious in nature. Both the RCMP and the Office of the Fire Commissioner are still investigating. Below is the building before the fire, the fire, and the carriages that were destroyed and will not be able to replace. 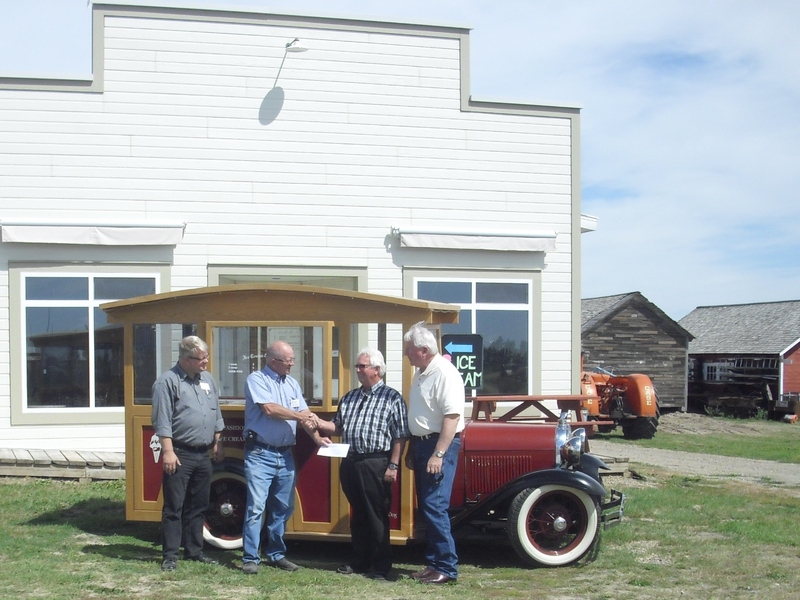 Thanks to a generous donation from Mr. Clarence Arnoldussen, the Museum now is the proud owner of a 1929 Ford Model A Ice Cream Truck. The photo below shows the transfer of the unit from Mr. Arnoldussen to Coyote Flats Pioneer Village. from left to right: Pieter van Ewijk, General Manager for Coyote Flats, Ron Svanes, President of the PT&EMS, Mr. Arnoldussen and Rick Casson, MC for the Car Show event at which the donation was first discussed. See the new ice cream truck in the parade in downtown Picture Butte at 11 am on August 15th and in the Parade of Power at Harvest Days at Coyote Flats Pioneer Village in the afternoon of the 15th and 16th.